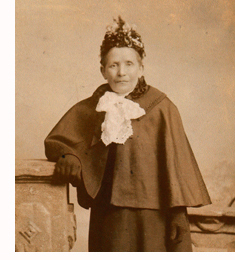 Selina Mansfield born 21st October 1834 in Crediton, Devon. Selina Mansfield born 1834 in Crediton, Devon. Selina Mansfield was born in Crediton, Devon, England on the 21st October 1834 and was christened in Broad Street Independent Chapel on the 7th June 1835. She was the ninth and youngest child of William Mansfield of Culmstock and Susanna Pearce Andrews of Topsham. Both towns are only a few miles from Crediton. In the 1851 Census she was aged 16 and still living at home with her Mother Susanna 59, and her older brother Jas. (James Pearce) 19. The address was High Street, Crediton and her occupation was given as a 'Shoebinder'. Although speculative, a Selina appears in the 1881 census and has evidently married a James Watts and now living at 2 Windsor Ct. Bristol St. James, Gloucester. Certainly, her age and birth place match exactly and the fact that James Watts was a Journeyman Shoemaker could explain how they met. The 1901 census then has the family living at 2, Johnnyball Lane, Albion Terrace, Bristol. Above: Extract from the 1901 British Census.